Zero harm and higher productivity. These are the core objectives when it comes to Health and Safety training and with the inclusion of technology-assisted learning, the future of risk reports and profit margins could look much brighter. To prepare a workforce for the rapidly evolving world of technology and industry, there needs to be an injection of experiential and immersive learning to help learners better equip themselves, at a much faster rate, for new machinery and Health and Safety compliance regulations. Companies also require a more cost-effective solution to roll out training to mitigate these impending risks. This is where the inclusion of Virtual Reality into training programmes can help align and equip your workforce to ensure competency and productivity. How exactly does VR achieve this? With all the hype around VR in the tech space, how exactly does it apply to the Health and Safety Industry? The answer lies in the context: when and where VR can be successfully integrated into training programmes to simulate the specific disciplines that the learner needs to implement within a 3D realm. One of the many benefits of VR is that the learner can be immersed in a stimulating environment reflecting different real-world scenarios, even potentially hazardous ones, from the safety of their training facilities. These scenarios are set up online and can be deployed across numerous sites at the same time, mitigating the need for specialist personnel and lengthy manuals making an operational rollout far speedier and more cost-effective. The learner can immerse themselves and physically practice within site-specific scenarios, without causing risk to themselves or property, and can be monitored and assessed until they have gained confidence and satisfactorily mastered the training. In addition to a safe training environment, this training can be designed using different perspectives of a potentially dangerous situation operatives are able to experience the implications of their choices or actions. This gives them a holistic understanding of a process that will significantly aid in the reduction of incidents. By giving people the freedom to fail, they will succeed because they retain more knowledge by learning from their mistakes and ultimately develop life-saving skills and workplace competencies. Where can VR be used to achieve Health and Safety training success? To help put into perspective how a VR solution can help with training success, let’s take a look at some realistic scenarios and examples of what is currently happening out there in the industry and see how you can apply it to your own health and safety training needs. Learners can investigate environments with pre-programmed hazards, and conduct risk assessments based on different industry scenarios. During these walkarounds and observations, learners can virtually observe scenarios to rate and then compile risk assessment reports. See this great example below from Metso, who created a game-like training solution for hazard identification in a workplace environment. Barminco have also developed a hazard identification solution for underground miners where they put together a checklist. Fire safety is another great example where there is a gap to fill between theory and practical training. 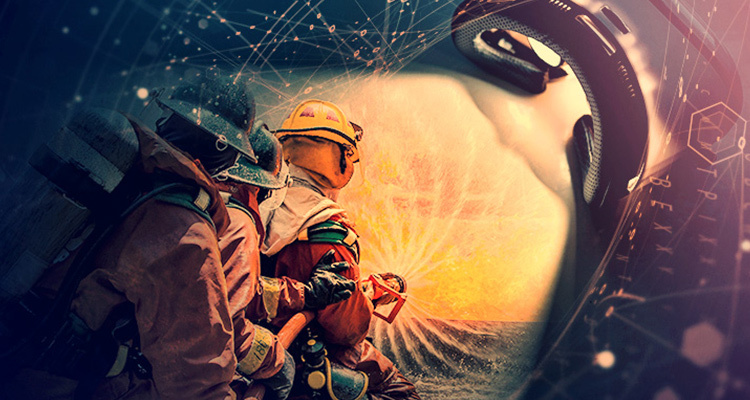 Virtual reality allows learners to simulate putting out fires and get familiar with the processes and equipment before graduating onto the real-time practical exercises. The team at Mammoth VR put together this great training solution for the PASS method of using fire extinguishers. And this great example educating the public on the importance of fire evacuation planning in New Zealand. Once the experience was complete, the learners were directed to an evacuation planner. In a safe virtual world, risk is mitigated by learners experiencing the consequences of their actions, without the potentially fatal consequences. The beauty of VR is that you can train in high-risk environments with no risks at all. In this virtual world, learners can practise the utilisation of safety harnesses, ladders and scaffolding. Below is an example of what VectorForm developed for DTE Energy. Are you ready to fill the training gap? I think it is fairly obvious, though some of the examples mentioned above, that Virtual Reality can fill the gap in blended learning solutions. It is the vital middle step between theory and on-the-job training where the learner can physically practice and build muscle memory so that they are ready to get on with the job in real life. There are many ways VR can play a role in your future training programmes, as it is based on real-life scenarios and incidents whether it be in the Mining, Construction, Maritime or Industry sectors. The beauty of this technology is that is can be fully customised to replicate your exact work environment, right down to the finest of details such as weather conditions, faults and damage. The data recorded from each session can be kept for training audit reports to ensure the compliance alignment and refresher training will be more meaningful as competencies are legitimately re-tested. The operational benefits of this data are that it can be turned into information which can aid companies in their operational productivity and overall effectiveness. In a world where technology and machinery are changing on a daily basis, and with the dawning of Industry 4.0 upon us, the urgency to keep incidents and risk rates down whilst remaining highly profitable will increase massively. Knowledge retention is critical when it comes to Health and Safety procedures, and with this incredible immersive technology, we have a tool that is ready to help combat risk and increase competence at our fingertips.